Old Faithful erupts more frequently than any of the other big geysers, although it is not the largest or most regular geyser in the park. Its average interval between eruptions varies from 60 - 110 minutes. An eruption lasts 1 1/2 to 5 minutes, expels 3,700 - 8,400 gallons (14,000 - 32,000 liters) of boiling water, and reaches heights of 106 - 184 feet (30 - 55m). It was named for its consistent performance by members of the Washburn Expedition in 1870. Although its average interval has lengthened through the years (due to earthquakes and vandalism), Old Faithful is still as spectacular and predictable as it was a century ago. 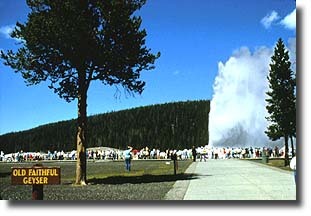 The largest active geyser in the world is Steamboat Geyser in the Norris Geyser Basin.